I want to talk about weight. Losing it, in particular, and the weird doppelganger that suddenly shows up to threaten the party. Over the last two years, I’ve been able to lose about 20 pounds and keep it off. After my high cholesterol scare (and with me only in my early 30s), I hopped onto the FIT bandwagon and I’ve been dancing to the beat every day. And I mean every day. I exercise in some form every single day with maybe a day off here and there during the course of a month. I rotate my exercises to match my moods and how my body feels so I might bike one day, run another or do weight lifting in between. 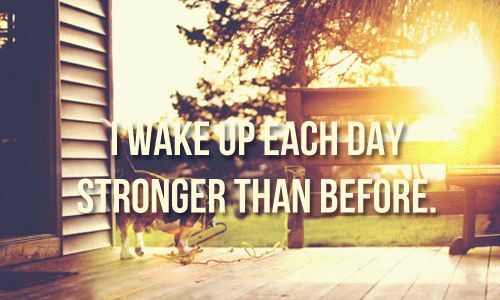 I love how I feel after I do a routine – more energetic, empowered, and beautiful. 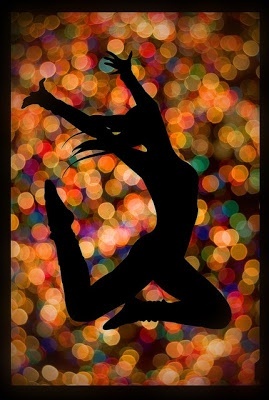 Am I dancing for joy? Except those times in-between. The times when my evil inner self decides to pull the plug on my happy music and throw the boombox out the window with an evil cackle. It’s like I suddenly acquire a Double me that is my old me – the more depressed, shy and undervalued weighty me. This me isn’t happy. This me wants to eat and eat and eat. This me hates many parts of my body and hates the way she looks. For some reason, this me wants me to go back to how I was, even though I fully recognize that I’m happier how I AM now than how I was then. During those times, I’m right back in the dark place I used to be when I weighed 20 pounds more. In fact, in some bizarre way, I feel even worse. If I let my double talk me into it, I’ll binge. I’ve done it over the last year where a plate of free cookies or free cupcakes will be sitting on a table at work or at a party and I JUST CAN’T STOP. Even though with every bite I hate what I’m doing and with every bite I realize that this isn’t even as good as my crazed scarfing indicates. I want to stop and I know I’ll feel worse later, but my hand shoots out and I grab another and another as if my hand recognizes that my brain will take control and it needs to get as much as it can. These moments are getting a bit better – they don’t happen quite so often because once they do, I feel so weepy horrible that I use that awful experience as a shield for when I feel like binging again. Do I want to feel that way again? NO. So I recall how it felt and breathe and move on. (Sometimes it actually works.) The odd thing is, when I was my old self, I never experienced that loss of control. Sure, I felt generally bad, but I didn’t feel like the world was ending when I would eat a large, unhealthy snack or dinner. It wasn’t until I lost the weight that my inner self started to split into two – the new me and the old me. And that’s something that doesn’t get talked about very much. I follow a lot of fitness blogs and while they talk about struggles and triumphs, I don’t hear a lot about the doppelganger that can suddenly materialize when you’re feeling insecure. I don’t hear about that other self who wants to sabotage everything they’ve worked for and drag them back into the dark place full of hatred and no music. I’ve just recently finished a book called The Undervalued Self by Elaine Aron where she talks about such a double that she calls the protector-persecutor. This protector-persecutor makes you feel bad about yourself to protect you for imaginary bad things. It made me realize that perhaps my own double is like the protector-persecutor in that they are trying to make me feel bad about myself so that I am saved the “disappointment” of feeling bad later when I gain weight (even if I never gain weight, the self wants to protect itself from the imaginary inevitability). She suggests some serious therapy that’s outlined in the book on how to deal with such a thing, which is daunting (and apparently my feeling that it is daunting is all part of the protector persecutor’s plan to keep me as is – scary? Confusing? Definitely!). At the moment I’m taking it day by day and trying to remind myself of all of the positives before I let my negative self take too much control. I tell myself that just yesterday I loved how I felt walking down the hall at work and that in 12 hours I surely couldn’t have changed so radically to warrant such self-hatred. Categories: Fitness, Life, Musings | Tags: body image, Exercise, happiness, Health, life, Musings, self image, willpower | Permalink. There’s no disputing that. My Japanese mother and white American father places me smack dab into that category even if my second grade teacher couldn’t answer my race question when I asked her as a small student filling out her standardized test form. But I don’t always feel so identifiable. Sometimes I feel more American than Japanese, like when I buy my groceries at my local Japanese store and the most I can understand is the welcome and leaving greetings. Other times I don’t even think about it and just feel like, well, me. For most of my life, though, it hasn’t been something I could ignore. The relentless taunting in elementary school, and later the odd comments about blood purity percentages and the selective deafness from strangers never left me doubting just where I stood. I read a lot of books, but rarely do I read books that strike so close to who I am. 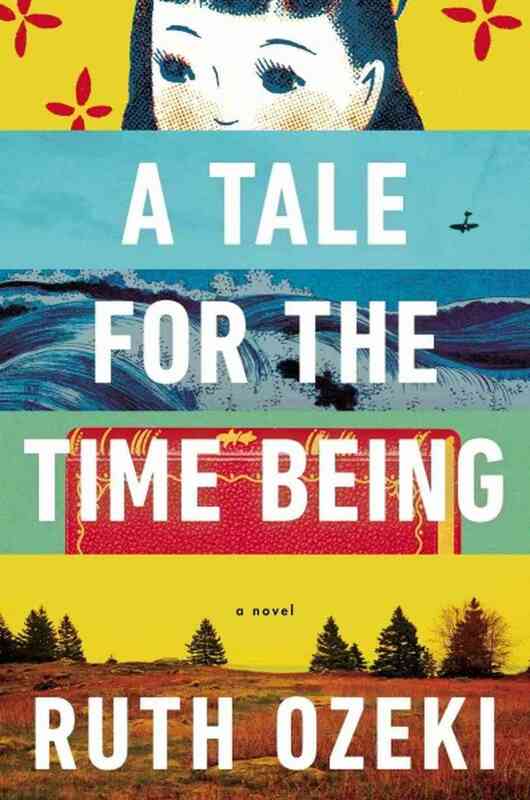 Ruth Ozeki’s A Tale for the Time Being, however, struck hard and quick. It’s a very complicated story, in that I would be doing it a great disservice to try to condense it here. Trust me when I say that this is truly a tale that crosses boundaries – with time, ethics and age. It weaves a tale that forces you to question existence, self-identity, and perception. It questions what it means to be “noticed” and to “not notice” or be forgotten. It taps into how we view our own agency and what gives our lives value. I was moved many times during this book and it was the first time when a novel touched something so deep within me that I rarely want to face. Race has always been up front and center for me. When your father is American and you’re living in Japan, you get noticed. When you’re back in America but you’re still the only Asian kid in the school, you don’t forget it. Every time you go to visit someone’s house and realize just how different their home is compared to yours, you don’t invite them over. It wasn’t shame, exactly. It was more playacting – trying to separate who I was at home from what I was beyond my front porch. It was, for the longest time, my way of dealing with being different. In fact, it made life even more difficult. Nao, the teenage girl in the book, lives a double life. She keeps what’s happening to her at school separate from her home. The one time it does cross, it brings the reality of her situation into the light and she’s forced to face it. While I was verbally bullied at school growing up, I was never bullied to the extent that Nao experiences. However, I can relate to her wanting something that made her special and strong – she developed her “super power” while I did my best to be a “super American”. I focused heavily on studying and being smarter than everyone else, I never brought up my background in a social setting and pretended that my home life was identical to theirs. I did whatever I could to make myself be “normal”. And while it did give me the strength to get through it all, it didn’t help my self-esteem. I found myself hating what I looked like even more because it wasn’t something I could change. A new pair of the hottest pants and the latest top might make me fit in, but I couldn’t change my eyes or the shape of my face. After a few unsuccessful life “resets,” I slowly came to realize that the only way to truly love myself wasn’t to deny who I was or to create a new me, but to be me. The girl with the curly blond haired, hazel eyed hubby. The girl with the house where you automatically take off your shoes at the door and eat mochi at New Year’s. The girl with the slanted eyes, quirky skirts, and dark brown hair with natural red tints that’s a bit dad and a bit mom. The girl that’s part Japanese and part American. I still haven’t fully come to terms with my dichotomy. Even as I type this, I remember everything and it’s difficult to contain it all. I want to talk about everything all at once. There are days when those evil words come and haunt me right back in the mirror. There are even days when I still encounter people who feel as if they need to remind me of what I am. I still struggle. But I have discovered that it’s also okay to be me. In fact, without the other, I’m not me. It’s that realization that helps me get through the tough moments. Categories: Life, Review | Tags: body image, books, courage, family, happiness, japanese, Musings, Review, self image | Permalink. I’m swimming my way back to you, babe. After the agonizing mall trip to find a suit that would “just do,” I didn’t consider how much I would love swimming. 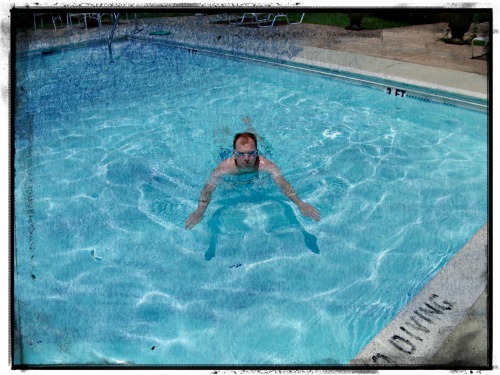 Not that what I do in the pool can be called swimming by any stretch of the imagination. Clinging desperately to my green-speckled float board and frantically kicking my feet whilst sinking does not qualify me for the Olympics. The thought that the suit would hang in my closet for the rest of the summer wasn’t a foreign one. I bought them on a whim and for a “just in case” scenario, but now I’m glad that I “took the plunge”. Our apartment pool is located in a semi-private space with tall trees and a brick wall blocking our pale selves from the innocent passerby. They have fiesta parties and grill-outs by the pool, but we’ve never attended. I think deep down, I felt too embarrassed even to go near the pool – the wall and iron gate were barriers I willingly embraced. Earlier, I had made a pact with my hubby that if there were a lot of people, we’d turn right around. I kept telling myself that buying the suit took more courage than I had exhibited before, and that I should be proud, but I knew I had something else to prove. 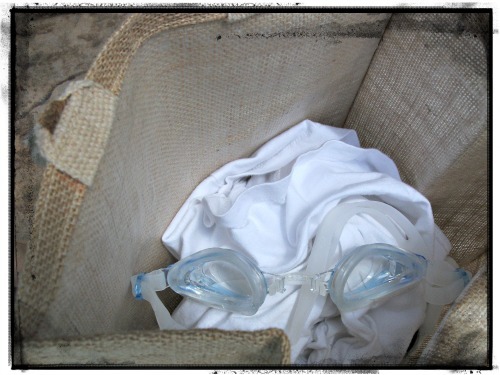 I wanted to do something that scared me in its danger (drowning is one of my top fears) and to show that I had changed. 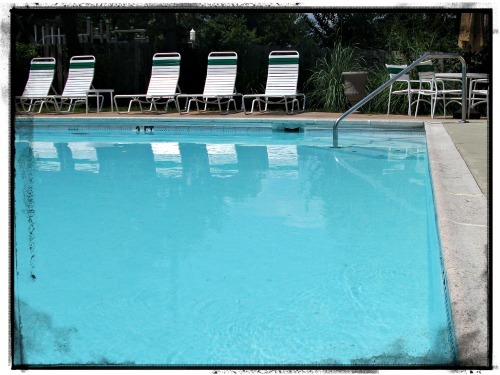 The warm day was perfect for swimming, but as we walked to the pool, trepidation thrummed down my spine making me feel slightly chilled. The weight lifted off my chest as I spied no one splashing about. Walking through that black gate felt transitional. I hadn’t considered using a pool since I was eight and unself-conscious. It was at my mother’s friend’s house, so even if I did feel embarrassed, it would have been with friends and in privacy. Now, I was in a public pool (albeit empty), and with a swimsuit (albeit a modest one). And I had fun! 😀 So much fun, that an hour of thrashing about in some semblance to swimming felt like only fifteen minutes. I was out of breath with a heaviness in my bones that signaled a great workout. I couldn’t wait to get back in. We’ve so far hopped into the pool every day this week. It’s also a lot more enjoyable to be exercising with my hubby at the same time. We do our own exercises at home, but we get to interact in such a way at the pool that’s more connected. The biggest coup? I stayed in the pool even when other people appeared. Was I nervous? Definitely, but I owned my nervousness and after a while I just ignored them. Was I proud? Categories: Fitness, Life, Musings, Photos | Tags: body image, courage, Exercise, Musings, self image, Summer | Permalink.